Arthrography allows radiographic examination of a joint after injection of a radioopaque dye, air, or both (double-contrast arthrogram) to outline soft tissue structures and the contour of the joint. The joint is put through its range of motion while a series of radiographs are taken. indications for arthrography include persistent unexplained joint discomfort or pain. 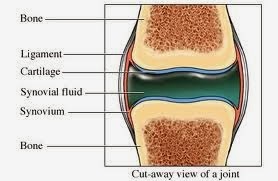 Magnetic resonance imaging of the joint may be used in place of this test. To identify acute or chronic tears or other abnormalities of the joint capsule or supporting ligaments of the knee, shoulder, ankle, hips, or wrist. To detect internal joint derangements. To evaluate damage from recurrent dislocations. Describe arthrography to the patient and answer any questions he may have. Explain that this test permits examination of a joint. Inform the patient that he need not restrict food and fluids. Tell the patient who will perform the procedure and where it will take place. Explain that the fluoroscope allows the physician to track the contrast medium as it fills the joint space. Inform the patient that standard X-ray films will also be taken after diffusion of the contrast medium. Tell the patient that, although the joint area will be anesthetized, he may experience a tingling sensation or pressure in the joint when the contrast medium is injected. Instruct the patient to remain as still as possible during the procedure, except when following instructions to change position. Stress to the patient the importance of his cooperation in assuming various positions because films must be taken as quickly as possible to ensure optimum quality. Check the patient’s history to determine if he’s hypersensitive to local anesthetics, iodine, seafood, or dyes used for diagnostics tests. The knee is cleaned with an antiseptic solution and the area around the puncture site is anesthetized. A 2” needle is then inserted into the joint space between the patella and femoral condyle and fluid is separated. The aspirated fluid is usually sent to the laboratory for analysis. While the needle is still in place, the aspirating syringe is removed and replaced with a syringe containing dye. If fluoroscopic examination demonstrates correct placement of the needle, the dye is injected into the joint space. After the needle is removed, the site is rubbed with sterile sponge and the wound may be sealed with collodion. The patient is asked to walk a few steps or to move the knee through a range of motion to distribute the dye in the joint space. A film series is quickly take with the knee held in various positions. If the films are clean and demonstrate proper dye placement, the knee is bandaged, typically with an elastic bandage. Tell the patient to keep the bandage in place for several days and teach him how to rewrap it. The skin is prepared and local anesthetics are injected subcutaneously just in front of the acromioclavicular joint. Additional anesthetic is injected directly onto the head of the humerus. The short lumbar puncture needle is inserted until the point is embedded into the joint cartilage. The stylet is removed, a syringe of contrast medium is attached and, using fluoroscopic guidance, about 1 ml of dye is injected into the joint space, as the needle is withdrawn slightly. If fluoroscopic examination demonstrates correct needle placement, the rest of the dye is injected while the needle is slowly withdrawn and the site is wiped with a sterile sponge. A film series is taken quickly to achieve maximum contrats. Tell the patient to rest the joint for 6 to 12 hours. Wrap the knee in an elastic bandage for several days if a knee arthrography was performed. Apply ice to the joint for swelling. Give the patient an analgesic. Ask the patient to report signs and symptoms of infection. Know that arthrography is contraindicated during pregnancy and in the patient with active arthritis, joint infection, or previous sensitivity to radiopaque media. A knee arthrogram shows a characteristic wedge shaped shadow pointed toward the interior of the joint, indicating a normal medial meniscus. A shoulder arthrogram shows the bicipital tendon sheath, redundant inferior joint capsule, and intact subscapular bursa. Structural abnormalities of the knee commonly suggest tears and lacerations of the meniscus. Extrameniscal lesion may suggest osteochondral fractures, cartilaginous abnormalities, synovial abnormalities, cruciate ligament tears, and joint capsule and collateral ligament disruptions. Shoulder abnormalities may suggest adhesive capsulitis, bicipital tenosynovitis or rupture, and rotator cuff tears. Incomplete aspiration of joint effusion dilutes the contrast medium and diminishes film quality. Hypersensitivity reactions to contrast medium. Persistent joint swelling, or crepitus.